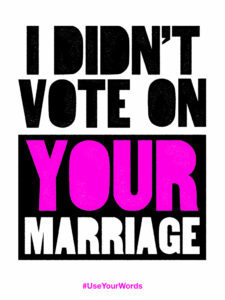 I didn’t vote on your marriage so stay the hell out of mine. Free digital download. Make your own sign. Make your voice heard. This artwork is free and we want you to be able to share it for free but you may not use it for any resale purposes. Free digital downloadable artwork. Helping you speak truth to power one download at a time. Liberal AF. #UseYourWords Disclaimer: This artwork is free and we want you to be able to share it for free but you may not use it for any resale purposes. All images are copyright Dirty Bandits and Paper Jam Press.